This waterfront cottage is perfect for a couple or a small family. 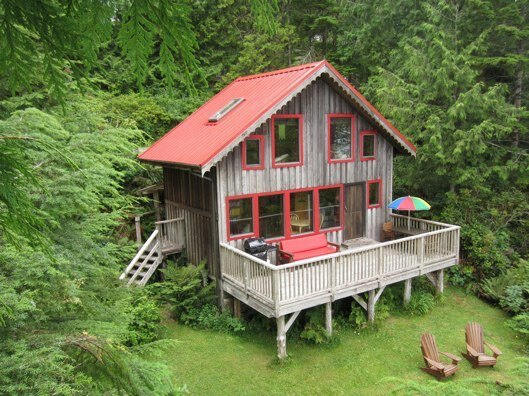 This unique and stunning oceanfront cottage is located on a peaceful private inlet beach front, within walking distance to restaurants and village centre of Tofino and a few minutes drive to the open sandy surf beaches and the Pacific Rim National Park. With a rustic and cozy feel, the cottage includes a full kitchen, living room, bathroom with tub and shore full deck and a beautiful view. The fantastic balcony gives you plenty of outdoor space to enjoy the magical setting and the ocean front views. 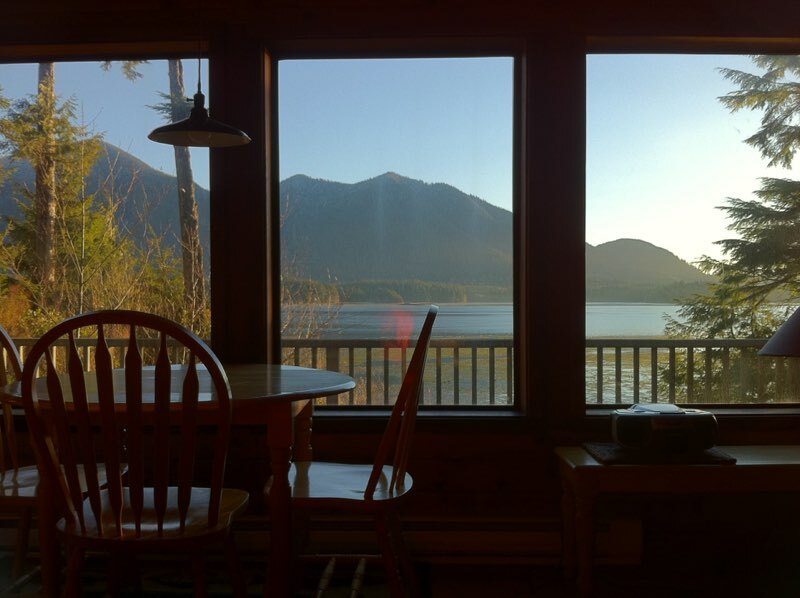 There is a working BBQ provided to enjoy outdoor dining or a glass of wine perhaps, looking out to the stunning inlet waters of Tofino, surrounding mountains and all the wildlife. The second floor includes an open bedroom with a queen size bed and sitting room, a sofa and two cosy armchairs. There is also a sofa bed in the downstairs living room for additional guests. The property looks out to the incredible scenery of Browing Passage with Meares Islands' Mt. Colnet in the background. This is a major staging area for waterfowl migrations including several varieties of ducks and Canada Geese. Sightings of blue herons, bald eagles, ospreys, kingfishers and several different gull species are an everyday occurrence for us. Grey whales, orca, porpoises, harbour seals, otters, and sealions frequently pass in view too, so don't forget to bring your binoculars and your camera! ​Launch your kayak, canoe or standup paddleboard right in front of the property via our private inlet beach access point. New TV with disc player and computer connections (no cable or satellite TV). ​All bed linens and towels are provided. For small children there is a crib and a highchair. The space is comfortable for a family with 1 or 2 children. We speak English, Français, Español, Schwyzerdütsch and Deutsch. Gisele and Verne have both been living in Tofino for over 40 years and feel very lucky to have raised their children in Tofino. 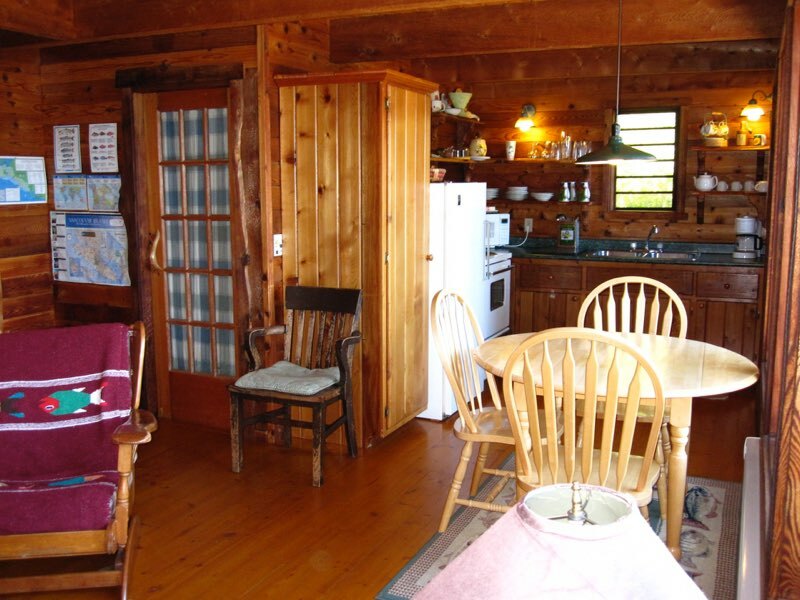 They welcome you to their beautiful waterfront cottage within a 1.2 acre forest! Both love nature and the outdoors, animals and meeting people. Their children own the local surf schools and the stand up paddle school and they can help you coordinate any activities you want to do! There are some cute chickens who live in the yard. Verne spends his time climbing and working on trees and Gisele works for the family business surf schools and looks after the grandkids. Long time locals, Gisèle and Verne have many tips for you to plan your perfect getaway here in Tofino; WELCOME! Verne & Gisèle’s home is located in Tofino, British Columbia, Canada, situated on the edge of the village, only a 10 minute walk to restaurants and stores.